This is definitely Algerian comfort food. A simple chicken noodle soup that can be spiced up with harissa or a chermoula relish at the table. This dish has often been described as Algerian chili. I suppose one can call it that when explaining it to an American audience. It does have beans, optional ground or minced meat and spices. But the similarities end there. The flavor and texture are very different. The white beans and chick peas are cooked to buttery tenderness that contrasts nicely with the spiced broth and piquant dirsa. Dirsa is a chili sauce made from fresh or dried hot red peppers. During the month of Ramadan every evening the fast is broken with dates and water, lben or milk or with fruit and nut drinks usually followed by a nutritious and invigorating soup such as harira. I won't give quantities for this recipe. You want to cook Algerian dishes, think like an Algerian. We cook intuitively and creatively with what we have. A shopping list with measured ingredients is unheard of. We go to the market or souk we buy what's available, sometimes that means just piles of onions and squash. You don't have lamb? Use a chicken. You don't have any meat? Omit it. Yes, there are versions with no meat. You don't have eggs? Omit them from the recipe. This is a very satisfying and easy to make soup. It's nutritious and full of strong, simple flavors. 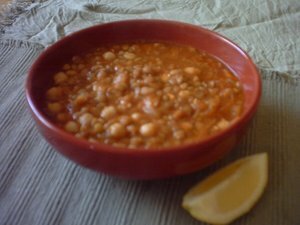 As with most Algerian dishes there are endless variations of chick pea soup. This the first in a series that I will post. It might come as a surprise to some that Algerian cuisine has a large range of vegetarian, vegan and whole grain dishes. Most seem to be more familiar with meat and chicken dishes. But that is not representative of the diet. My family ate an unusually high amount of lamb and beef compared to most.